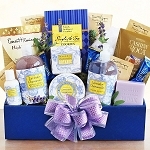 A BEAUTIFUL GIFT FOR THE GRIEVING HEART ... at times of bereavement, receiving this beautiful sympathy gift basket conveys comforting Messages of Hope for the First Year of Grieving and Beyond. The basket is full of fine gourmet foods along with touching words of solace for the grieving heart... "Remembering with Love" is a beautiful softcover book with an affirming gift for those grieving the death of a loved one, this book offers compassion, comfort, and guidance. Over three hundred short pieces remind us that we are not alone, and that we can and will survive. 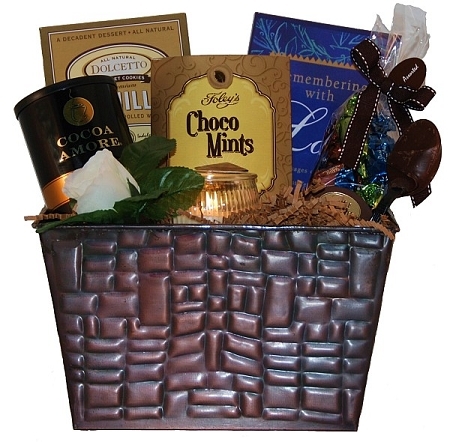 The basket also includes Cocoa Amore Gourmet Cocoa, a Chocolate Dipped Spoon, Choco Mints, Dolcetto Chocolate Wafers, Seattle Chocolates Truffles, a scented candle for quiet moments of reflection, and a silk rose The Remembering With Love Sympathy Gift Basket comes in a beautiful embossed rectangular pail, includes the matching GiftProse greeting card and optional prose along with your personal sentiment.